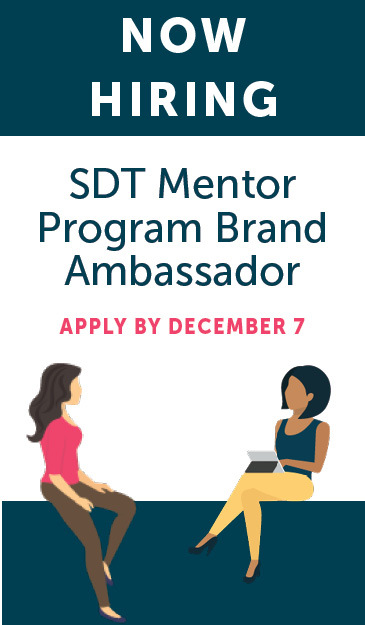 Sigma Delta Tau is proud to offer an online mentorship program to connect our student members directly with alumnae for interviewing tips, career advice, and professional development. We have partnered with Ambition in Motion, an online mentoring platform, to develop this program. Using the Ambition In Motion matching algorithm, students are matched with alumnae based on various compatibility factors including career interests, majors, and more across all chapters nationwide. The online platform allows you to interact and share experiences through the program. This platform also hosts live, online workshops around mentorship etiquette, how to prepare for each mentorship conversation, and how to ask the right questions. The platform provides video and written content to help prepare you for the program. You will also have access to the Ambition In Motion employer network. If selected for the program, you will be provided with your mentor’s contact information so you can connect based on your communication preference – whether that be via email, video chat, phone calls, or in-person meetings. Ambition In Motion would like to hire one Brand Ambassador from each of our chapters with the responsibility to encourage sisters to join the program, answer questions about the program, and ensure that the program runs successfully. This is a paid position in which you will have the opportunity to improve your professional communication skills, gain opportunities to further involve yourself with the campus community, and aid in the professional development of your sisters. The deadline to apply is December 7. The mentorship program is a great opportunity for you to share your career experience with a current undergraduate student of Sigma Delta Tau. This program gives you the flexibility to connect with your mentee on your own time. Over the course of the semester, we ask that you have, at minimum, three 30-minute conversations with your mentee. These mentoring conversations can take place in-person (if matched locally), via video chat, or over the phone. We strongly encourage you to apply for this rewarding program. The deadline to apply is February 3, and the Spring program runs from February 15 to May 10.